Cody Trout Ranch and Campground is a brand new 30+ RV pull through campground which would accommodate any motor home as I believe our RV camp site was 60′ long with at our site 50 amp electric, water, and sewer hock-up. 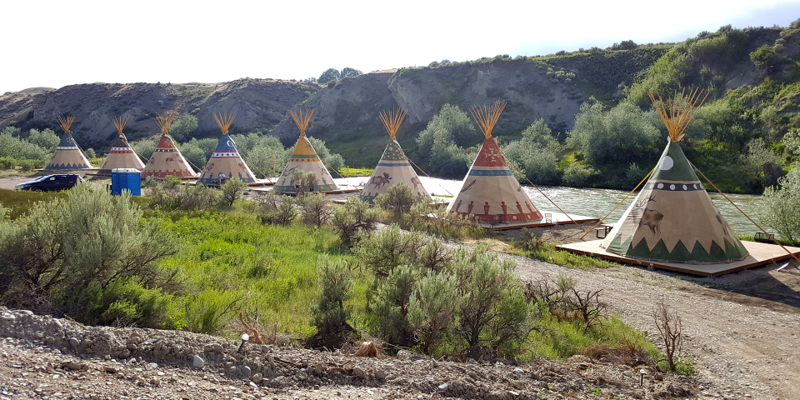 We were able to enjoy their high speed internet service and even catch and release trout in a nice fishing pond by two of their 10 tipis. Our other friends enjoyed staying in a huge tipi name Buffalo (hand painted on the side of the 20′ tipi) It had the most amazing Indian decor and very comfortable beds. But most of all it was located right on the shore of the Shoshone River. Making Smores while listening to the river and watching white water rafters go by was so much fun. The owner Larry is such a great guy and is constantly improving his campground. Cody Trout Ranch and Campground is less than 5 miles out of Cody on 14A. You will not regret staying. I found the information while surfing the web and got on his Wyomingtroutranch.com website. I am sure he is listed other places but this is where I got the info.